Most of us know figurines as ornamental trinkets. They’re diminutive, breakable, and invariably sentimental. Modern-day iterations are often angels and fairies, rosy-cheeked children and big-skirted princesses. 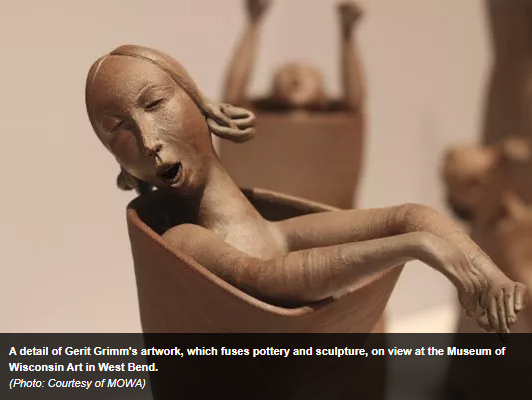 I’ve never been a figurine collector, but I’ve been thinking about them a lot since viewing Gerit Grimm’s ceramic sculptures at the Museum of Wisconsin Art. Her calling card is a method of creating figures and tableaus by fusing pottery and sculpture. Grimm begins with wheel-thrown pots that might become a torso or a skirt, a tree trunk or a boat hull. On to these foundational shapes she layers delicate and telling details that give each a story to tell. “Gerit Grimm’s Fairytales: In a Time Neither Now Nor Then,” curated by MOWA’s Graeme Reid, fills the changing-exhibits gallery with the results of this painstaking process. Seven groupings of figurative ceramic sculpture are installed to easily accommodate 360-degree viewing. All are rendered in the unglazed, stone-brown clay Grimm has been working with exclusively since 2011. Walking through the exhibit can feel like a stroll through an enchanted forest populated by characters from – as the exhibit’s title implies – a book of fairy tales. (That Grimm shares a last name with the famous storytelling brothers is a delicious coincidence.) But the “fairy tales” label, rich as it is, risks putting Grimm’s sculptures into too small a box. Her inspiration springs from a stew of classical mythology, Biblical stories, folklore, Renaissance paintings, children’s books, and decorative crafts among many others. In describing her work, she has referenced dolls, puppets, and the theatrical traditions of commedia dell’arte. Her earlier work – colorful, highly glazed, and smaller in scale – hearken to Meissen figurines of porcelain shepherdesses and gentlemen. To this she adds her own lived experiences and interests (she tango dances and sails in her spare time). The MOWA show spans seven years of Grimm’s output. It is populated by villagers, peddlers, children, lovers, boaters, mourners, a nobleman, a bride, an executioner, and an alchemist. They play out scenes from the Bible, Greek mythology, folklore, and Grimm’s own imaginative (and often witty) re-interpretations of all the above. “Wedding Procession of Psyche” (2015) is a scene from Greek mythology in which the doomed bride is surrounded by attendants, some carrying bouquets and others sheathed in funeral attire. “Fountain” (2011), which evokes the centerpiece of a village square, is seething with frolicking couples and fish spitting water. In a series of four trees (2011-'15), Grimm tells stories about gloom, happiness, love, and community by festooning each tree with mothers and babies, couples and lovers, children at play and adults at work. Elsewhere we see a horse-dawn carriage, a monument to an 18th century ceramics patron, an assembly-line of beauty-salon body parts, and mythology’s Ulysses encountering sirens. It’s easy to greet this exhibit, at first, as a collection of dolls and puppets. Grimm plays with that first impression, then upends it. Seeing puppet-like figures chop off a head (“Guillotine,” 2012) and doll-like characters carry a corpse (“Entombment,” 2017) is our first clue that something else is going on here. Three of her sculptures are life-sized, looking us straight in the eye. We notice, too, that the garments are from no distinct era, which plays with our sense of time and setting. This upending also has much to do with the astonishing results Grimm coaxes from her medium, imbuing each figure with a sometimes haunting, sometimes humorous sense of presence. Hand gestures, facial expressions, even the eye contact between figures are magically expressive. These details add complexity to the stories each character tells. Along with the absence of color, Grimm is renegotiating her relationship – and ours – with the ubiquitous ceramic figurine. We can see that relationship evolving. In her most recent works, Grimm’s pots take on more qualities of fabric, revealing the movement of limbs beneath. The detailing is more sparse, and a subtle note of abstraction is introduced. Her “Sirens” (2016-'17) squirm in their Martha Graham-like garments – are they trying to extract themselves, or conveying a message? It’s a universal human-vs.-wardrobe tussle choreographed so artfully your eye keeps returning to the dance. The most recent sculptures are installed at the back of the gallery: five groupings depicting the crucifixion and entombment of Christ (2017). They are more distilled and, to my eye, more intensely felt. After her father’s unexpected death in 2016, Grimm found herself turning to the topics of mourning and grief by using, as usual, age-old symbols as touchstones. Her “Lamentation” is suffused with tender sadness. Her “Pieta” merges an animated figure with a clumsy, lifeless one, in a sobering juxtaposition of love and loss. Even setting aside subject matter, this exhibit begins on a lighthearted note and slowly insinuates an unsettling theme. Grimm is aware that there’s an awkwardness to her figures. The tension created by joining high and low themes is a conscious one for her. It’s as if she’s rescuing the figurine from its enslavement to coyness and decoration, which disrupts accepted and long-held associations. I don’t think it’s a coincidence that so many of her figures recount stories about women, especially women under duress. Grimm’s female figurines have grown up, found their own voice, and are much less delicate than their antecedents. Despite initial appearances, you have to take them seriously. “Gerit Grimm’s Fairytales” is on view through Jan. 7 at the Museum of Wisconsin Art, 205 Veterans Ave., West Bend. For more information, visit www.wisconsinart.org. Diane M. Bacha is editorial director at Kalmbach Publishing Co. and a former arts editor.